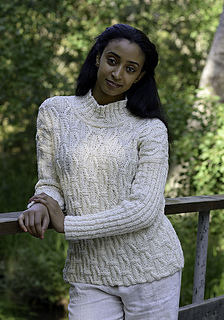 A relaxed comfortable sweater, perfect for almost any everyday occasion. 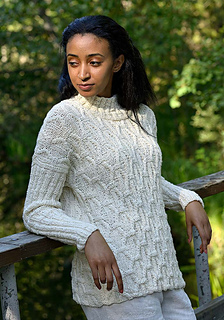 The interesting asymmetrical cable pattern creates a nice contrast to the simple structured rib pattern on the sleeves and collar. 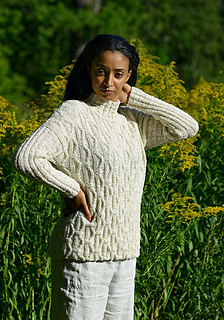 Welts at the top of the sleeves and around the neckline add sophistication and the Misty Wool yarn supplies character. The cable pattern is charted and the rib pattern has written instructions.